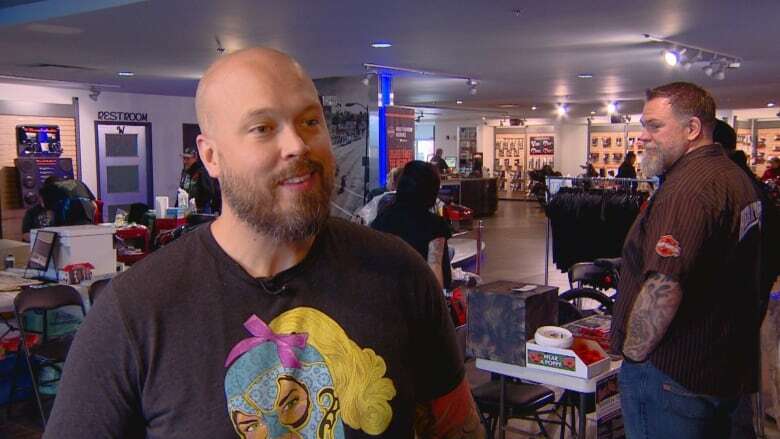 A group of tattoo artists has gathered in Edmonton, hoping some permanent ink will raise money to help heal an invisible wound. 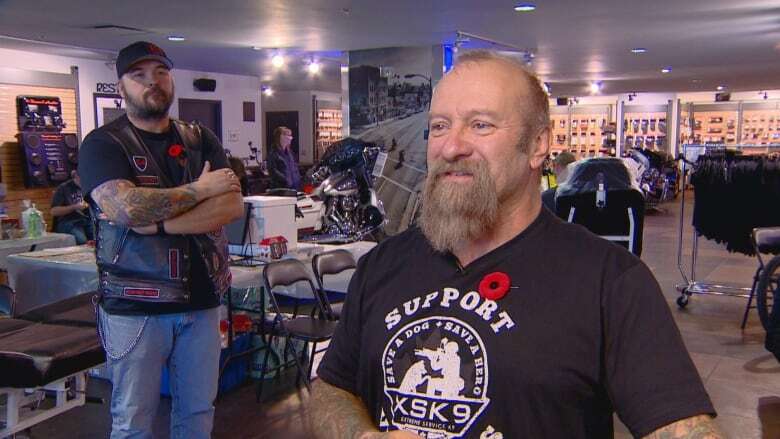 Artists from across the province are volunteering their talents to raise funds for XSK9, a local organization that connects service dogs with veterans dealing with post-traumatic stress disorder. The week-long fundraiser kicked off Saturday at an ad hoc tattoo shop in the back of the Heritage Harley-Davidson dealership. Clients pay for a tattoo and the proceeds go to XSK9. Bear Lamont, founder of the non-profit and a former private military contractor, said he started the organization after struggling to find local resources to connect him with a service dog. "They can literally change the life of a veteran," said Lamont, who eventually got connected with a service dog. "I know the values and the benefits that a service dog pays to most people." The fundraiser offers Lamont, who has been a tattoo artist for 30 years, the chance to blend his artistic and philanthropic passions. "It's really awesome for me personally. It gives me the opportunity to pay forward and pay back," he said. The 2018 federal budget proposed expanding the medical expense tax credit to offset the costs for a psychiatric service animal. But service dogs are in high demand, and many veterans are placed on long wait lists in the absence of a program from Veterans Affairs Canada, Lamont said. "The wait list for dogs increases the more that people become aware of the fact that they're available and it's something that could help them," he said. Veterans Affairs launched a pilot program in 2015 to study the impact service dogs have on veterans with PTSD. The results found the participants had fewer nightmares, a long-lasting reduction in depressive symptoms and an improved quality of life. But the future of the program was put in limbo after the Canadian Generals Standard Board announced in April that it would not develop a national training and behavioural standards for service dogs, a condition for turning the pilot into a permanent fixture at Veterans Affairs. Lamont expressed hope that the fundraiser will help XSK9 move toward its goal of raising $80,000, which will help train up to eight service dogs. John Roberts, a Calgary-based artist who apprenticed under Lamont when he started tattooing 13 years ago, made the trip north to offer his services for the weekend. He said it was an opportunity to help a friend and support veterans dealing with PTSD and other forms of mental illness. "They should get the kind of help they deserve always, especially in this country with so many great resources and people that care," he said. "Nobody listens better than a dog." Geoff Zak paid $160 to get a tattoo of a German Shepherd on his upper arm. The price wasn't a concern, he said, knowing that it was going toward a worthy cause. "What they're looking to do, it would be a big difference to some people's lives," he said. The fundraiser wraps up Nov. 10, just before Remembrance Day.